This recently refurbished ground floor condo overlooks the 8th hole on the widely acclaimed 18-hole, par 5, handicap 3 golf course designed by the renowned Arthur Hills. The unit features granite counter tops in kitchen and bathrooms, all tile flooring and a 2 bedroom/2 bathroom split floor plan. The eat-in kitchen opens to a formal dining area and comfortable living room looking out to the private lanai - providing shade in the afternoons, and the golf course - perfect for our casual Florida style of living. The living room is equipped with a flat screen TV, sectional sofa and a wet bar for entertaining. It opens to your private lanai - shaded in the afternoons, with tranquil & serene views of a perfectly manicured green landscape. Master bedroom has a new California King size bed, flat screen TV, desk, walk in closet, and an en suite bathroom. Guest bedroom has a new full size bed and a flat screen TV. Full size washer/dryer in unit for added convenience. Reserved carport and BBQ grill is directly in front of the unit. Short walk to clubhouse, tennis courts and 2 pools. Stoneybrook Golf Club community offers golf, tennis, pool, walking and jogging trails, clubhouse dining and bar. Nearby access to the Legacy Bike Trail and a convenient drive or bike ride to shopping at Westfield shopping mall, Costco, Lowe's, movies, restaurants, and a 15 minute drive to the world famous Siesta Key Beach or downtown Sarasota. 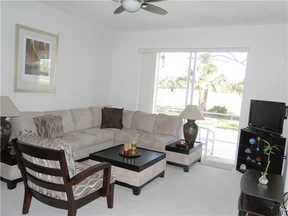 Vacation rentals, close to Siesta Key. Optional Golf and Amenity transfer fee $200.